Zipping about in the patches of sunlight down by the jetty at Danau Girang Field Centre were many jewel-like tiger beetles. Capturing them on camera was the real challenge because as soon as they noticed your movement, they were off like a shot! The trick was to wait next to a patch of sunlight where you had recently seen a tiger beetle. If you sat still enough for long enough, an individual would eventually scuttle into your camera’s field of view. Emma staking out a patch of sunlight waiting for a tiger beetle. The tiger beetle shot Emma took moments later. Tiger beetles are in the family, Carabidae, the ground beetles. 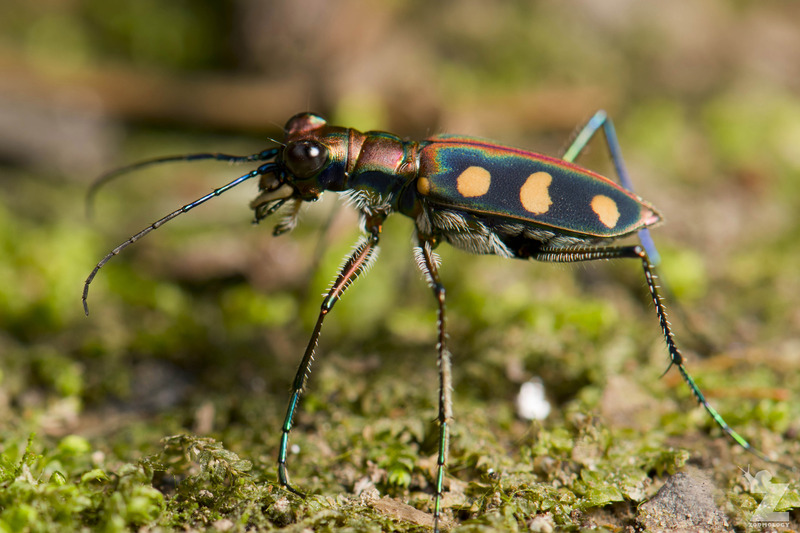 There are approximately 2,600 species and subspecies of tiger beetle currently known. 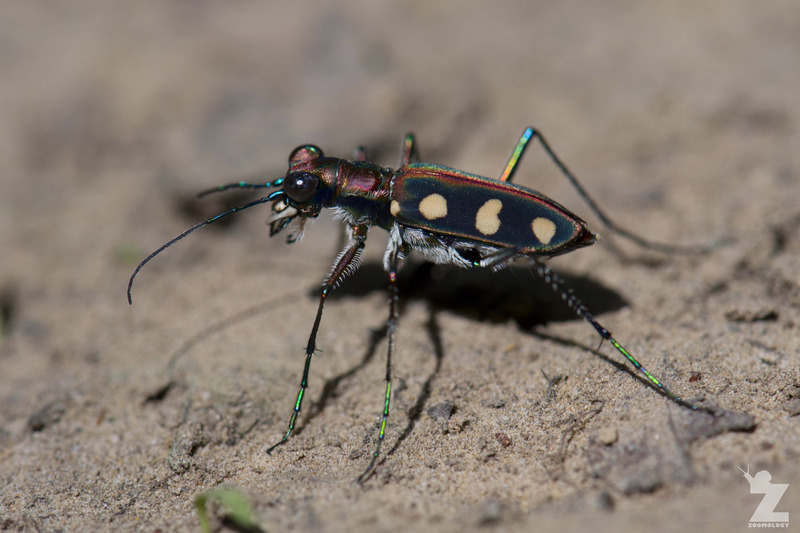 Tiger beetles are known for being aggressive predators and for their fast running speed. In fact, the fastest species of tiger beetle, Cicindela hudsoni, can run at a speed of 9 km/h (5.6 mph). To put that into perspective, that’s about 125 body lengths per second! There is an interesting side-effect to running so fast: When they move too quickly, their eyes cannot gather enough light to form an image of their prey, so the tiger beetle has to stop briefly and re-orientate itself before dashing after the prey again. This is called a stop-and-go chase pattern. If you watch any tiger beetle for a while, you can easily observe them doing this. All tiger beetles in both adult and larval stages are predatory. The larvae live in burrows in the ground. They wait at the top of these burrows for small insects to wander close enough to capture. The adults use their speed and large, curved mandibles to chase and capture prey. They will eat just about anything they can catch, which is usually other invertebrates. But, they have been known to scavenge for their food and occasionally to scavenge on even vertebrate animals. 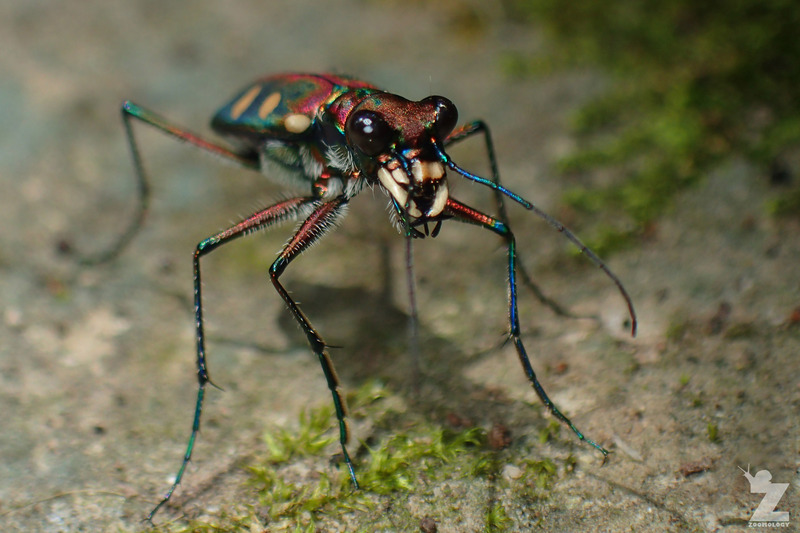 The golden-spotted tiger beetle, also known as the blue-spotted tiger beetle, was first described in Sumatra but occurs over much of Southeast Asia. They can be found in a wide range of sandy habitats, including near shorelines, river bars, sand dunes, mangrove fragments and forest trails. They can reach approximately 16–18 millimetres in length. Their elytra (the protective wing-covers) are dark blue-green, with six large yellow or bluish spots and two smaller spots on the shoulders. They have giant compound eyes, large jaws and pale coloured hairs on the abdomen and legs. Wow! They are really fast! It’s an interesting information why they stop from time to time. I know, right?! Thanks for popping by, Helen! Amazing photos! I love those colours.